This guide provides some general guidelines to planning a deployment on Red Hat CloudForms. This includes creating multiple regions containing Red Hat CloudForms appliances, CPU sizing recommendations, database sizing recommendations, and database configuration. Regions are used for centralizing data which is collected from public and private virtualization environments. 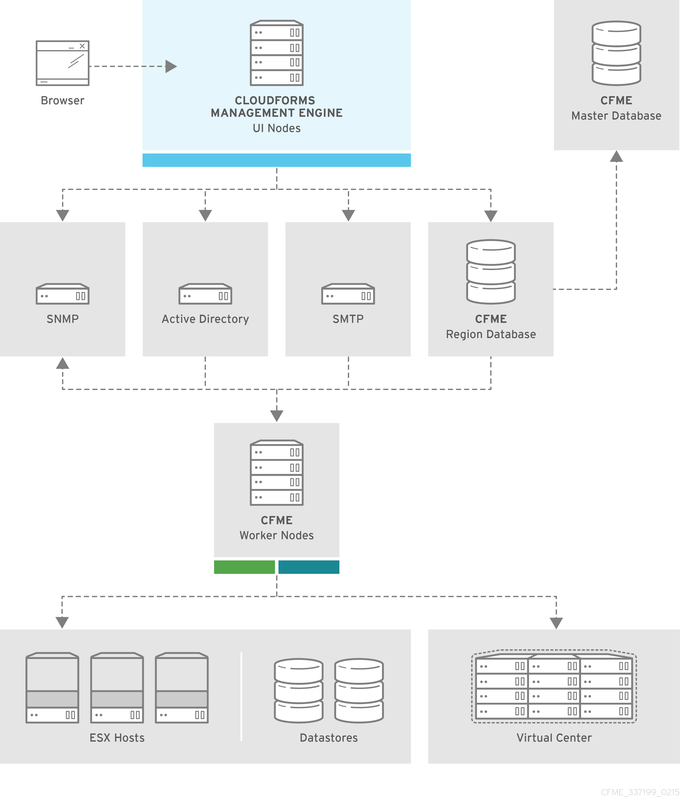 A region is ultimately represented as a single database for the VMDB. Regions are particularly useful when multiple geographical locations need to be managed, as they enable all the data collection to happen at each particular location and avoid data collection traffic across slow links between networks. When multiple regions are being used, each with their own unique ID, a master region can be created to centralize the data of all the children regions into a single master database. To do this, configure each child region to replicate its data to the master region database (Red Hat recommends use of region 99). This parent and child region is a one-to-many relationship. Regions can contain multiple zones, which in turn contain appliances. Zones are used for further segregating network traffic along with enabling failover configurations. Each appliance has the capability to be configured for a number of specialized server roles. These roles are limited to the zone containing the appliance they run on. Only one failover type of each server role can run in a zone. If multiple appliances have the same failover role, the extras are used as backups that activate only if the primary appliance fails. Non-failover server roles can run on multiple appliances simultaneously in a zone, so resources can be adjusted according to the workload those roles are responsible for. The following diagram demonstrates an example of the multiple regions working together in a Red Hat CloudForms environment. The Master appliance is located in Chicago and contains a master region and a subregion that manages the worker appliances. The Mahwah technology center contains a single subregion that manages two zones. Likewise, the San Diego technology center contains a single subregion managing a single zone. Replicating a parent region to a higher-level parent is not supported. Parent regions can be configured after the child regions are online. In this region, we have several Red Hat CloudForms appliances acting as UI nodes and worker nodes. These worker nodes execute tasks on the providers in your environment. The Region also uses a region database that reports to a master database on the main Red Hat CloudForms appliance. All appliances can connect to the authentication services (Active Directory, LDAP, Identity Management), outgoing mail (SMTP), and network services (SNMP). Red Hat CloudForms supports multi-tenancy, letting you isolate one tenant’s resources and user accounts from another. In addition, tenants can be nested in a hierarchy, enabling those at the bottom to inherit permissions from those above. This configuration allows for granular user permissions to be set on specific tenants. Tenantless - Similar to the previous system without tenancy support, you can create a single large tenant and perform all your operations in there without any subdivision of resources or user accounts. Enterprise model - A common scenarios is to create a single tenant, and then subdivide it based on the structures or departments within your organization. Those departments are then able to further subdivide their resources into distinct projects. With this model, you have a single URL for user access, while still having the ability to divide resources into nested hierarchical tenants. 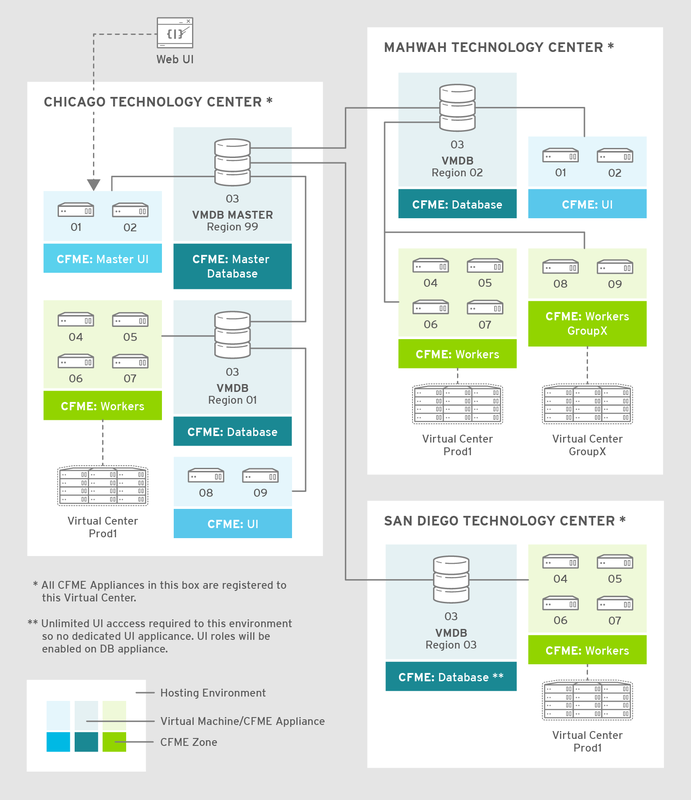 Multiple tenant model (CCP) - Created with Certified Cloud Providers in mind, this model allows multiple tenants to enjoy complete isolation from other tenants, with separate branding and unique URLs. # values can be found in the PostgreSQL documentation. # The commented-out settings shown in this file represent the default values. # you need to reload the server. # with the "SET" SQL command. # option or PGDATA environment variable, represented here as ConfigDir. # If external_pid_file is not explicitly set, no extra PID file is written. #max_connections = 100			# (change requires restart) Note:  Increasing max_connections costs ~400 bytes of shared memory per connection slot, plus lock space (see max_locks_per_transaction). # per transaction slot, plus lock space (see max_locks_per_transaction). # actively intend to use prepared transactions. #silent_mode = off			# Run server silently. # requires track_counts to also be on. # These settings are initialized by initdb, but they can be changed. deadlock_timeout = 5s			# MIQ Value - one second is too low, 5 seconds is more "interesting"
#exit_on_error = off				# terminate session on any error? #restart_after_crash = on			# reinitialize after backend crash?